Could this fires season cripple California’s economy? More than a dozen wildfires have already caused over $20 million in damage, even though it is just the beginning of a fire season that could cripple the state’s economy, Gov. Jerry Brown said Sunday on ABC. 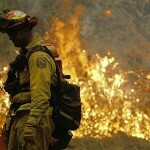 The state, which has set aside $600 million for firefighting, has approximately 5,000 firefighters currently on the job. However, that may not be enough. “We’re getting ready for the worst,” Brown said. “And in the years to come, we’re going to have to make very expensive investments and adjust. And the people are going to have to be careful of how they live, how they build their homes and what kind of vegetation is allowed to grow around them. Even though fire season is just beginning, the California department of Forestry has already battled more than 1,500 blazes this year, almost double the average of about 800 fires per year. Paso Robles Fire Department Battalion Chief Kevin Taylor usually doesn’t leave home until late July to assist other agencies during the fire season. Nevertheless, he was dispatched to the Los Angeles area in January and led a crew that began work near San Diego on last week. It’s not the fires, it’s the history of horrible government spending money like water. From what I am hearing, this will be only one cost associated with the drought. The bigger cost will be decreased tax revenues from farmers as they have to let fields lie fallow for lack of irrigation. The numbers I have heard for projected lost farm income are $1-$2 billion. That will result in additional indirect costs such as disaster relief, various support programs for laid-off workers and decreased income to both suppliers of farmers and to other businesses which they and their workers would patronize if they had the money to do so. Watch out Californians. More fires will create more fire fighting expenses which will increase budgets across the board, then comes the “need” to raise taxes. “Never let a good crisis go to waste” The government will demand more money from us or threaten to reduce services. Don’t forget the other play from the government handbook titled “How to raise taxes on the shrinking middle class” when there isn’t a crisis create one or try to make everyone see one where there isn’t one, either way they claim a need to raise taxes. The terrible fire danger is the result of the history of suppressing wildfires. A huge mass of highly flammable brush has built up and now forms a ticking time bomb that is about to explode. Some of these areas haven’t burned for 20 years or more. When you look at the subsurface layers you can see that these coastal areas burned about once every 7 years on average. We have to adopt new policies and practices. Fight fire with fire. The best tool for controlling wildfires is fire. There is much truth to what you say but two problems exist that make your solution a lot more complicated. Second, the drought has made the conditions so bad that it is almost impossible to find a time when you can safely do a controlled burn now. Yes there will be a few windows but they will be too few to get much done. Don’t forget about the fire tax that has already been levied on us. The estimated total for that was around $84 million and none of that goes towards fire suppression. It’s just another layer of government costs to remind us not to play with fire. Whatever happened to Smokey the Bear who did such a good job for far less than the $84 million? Get ready for another fire tax to be proposed of which a good portion will have to be diverted to the inflated pensions that will have to paid for. We don’t need anymore excuses for our funding shortfalls, we are already crippled. When considering the cost of California’s Gov, the funding for retirees has got exceed the budget for the working staff. This state will likely implode and it will not be because of water or fire, it will be because of modern-day pestilence.